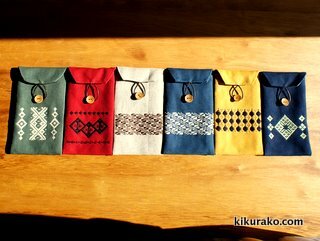 Mobile phone pouches with Kogin-zashi needlework are created. They even cover 4.3-inch wide phone, so they fit most cell phones, cameras, and music players. We have made larger pouches with the same design for 11-inch Apple MacBook Air cases.